You’re the eldest son of one of the most reviled men in popular culture. You’re violently well-off, love guns, and have far too much free time on your hands. You, my friend, are Donald J. Trump Jr. And on the internet’s many hunting message boards, you have apparently found your home. Before we explain, let’s recall how back in 2012, the elder Trump sons made headlines after photos of their recent big game hunt in Africa were made public. 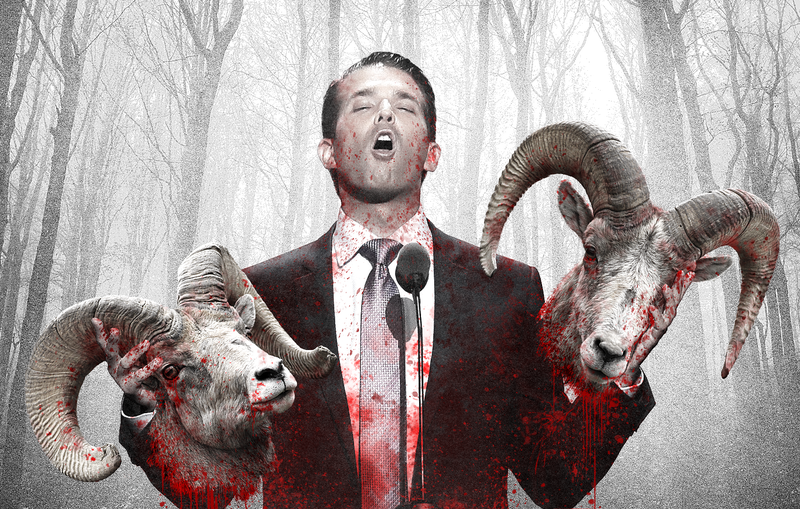 While no similar photos have made appearances since, Donald Trump Jr.’s bloodlust remained as strong ever. His hundreds upon hundreds of online hunting forum posts can attest to that. What was Donald Trump Jr. up to in August of 2011? Our boy isn’t just a casual forum haunt, though. Don Jr.—or someone doing a convincing and thorough impersonation of him—is a registered member of at least 25 different gun, bow, hunting, and fishing enthusiast forums. There’s Speciality Pistols, Brian Enos’s Forums, and Tradgang; Accurate Shooter, go2gbo, Stickbow, Tradtalk, and Archery Talk; Greybeard Outdoors, Long Range Hunting, The Fly Fishing Forum, Handgun Hunter, CastBoolits.Gunloads.com, Sniper’s Hide, and 24hourcampfire; Trout Predator—Trout Predator!—and Predator Masters Forums; Saddle Hunter, TradRag, Saubier, and Crossbow Nation; 1911Forum.com, Shotgun World, The High Road, and Benchrest Central. This list is almost certainly incomplete. On each one, he identifies himself as either “djtjr” or, less often, “djt.” On Accurate Shooter, however, he bares his full name—I’m fairly confident this was an accident. The vast majority of these thousands of combined forum postings consists of strictly technical hunting talk—bullets, powder, how to get your young daughter into hunting by buying her a pink rifle. Guy stuff. These message boards aren’t just for talking shop, though. They’re also a place for enthusiasts to unwind and talk about their “favorite gun-related quotes.” Say, Don Jr., what are your favorite gun-related quotes?